If you’re reading this blog, you’re probably at least a bit like me, and you take slightly more pleasure in finding the path less traveled. In fact, when you stumble onto those gem places where you fool yourself into feeling like you’re the first to see something, it feels like hitting a jackpot. In the Galapagos Islands of Ecuador, though, you need to be prepared to be herded around without taking ONE STEP OFF the beaten path. And let’s hope it ALWAYS stays that way. Because if it didn’t, a visit to the Galapagos wouldn’t come close to the incredible and hard to describe experience that it is. Before I visited the islands, I had visions of paddling around the archipelago on a sea kayaking trip going where the motor boats couldn’t and maybe camping on an island, or searching far and wide to locate an outfitter or guide who could deliver something unique in some other way. Of course, there was no way I wanted an experience that the everyday tourist had. I had no way of knowing that the entire Galapagos experience would in and of itself be the unique nature-nirvana I was searching so intently for. Most people who travel to the Galapagos Islands sign up for an everything-is-included trip on one of the yachts or cruise ships, which are somewhat standardized and categorized into economy, tourist, tourist superior, first class, and deluxe. One look at pictures of each boat on the internet, and you can pretty much categorize them yourself…no secrets there. I had the good fortune both times I went of being able to spend some time in Quito, Ecuador, before each trip, where I was able to find last minute deals posted on the boards at tour company offices; both times I paid much less than almost everyone on the boat, who had signed up months in advance. Once you report to your boat, you are essentially conscripted to the oversight of your naturalist guide, whose job it is to provide you with incredibly close encounters with Galapagos wildlife and natural communities, and to check in often with you to make sure you’ll tell all your friends what a great experience you had aboard the boat they work on. They also are there to make sure you comply with rules of the park; and the rules of the park are fairly simple, but dead serious. Visit only designated areas at scheduled times. Stay only on clearly marked paths. Stay within sight of your guide. Don’t touch or feed the wildlife or pick plants. Now, I consider myself an informed traveler. I’m a biologist, in fact, and I have a pretty good handle in the “respect nature’ department. When first exposed to the strict oversight….well, at first I felt a bit suffocated to be honest. I would purposely stall on the trails to fall behind to watch birds or take pictures of flowers, just out of the guides’ sight. I was SUCH a rebel ….a regular Che Guevara. As you spend more time on the various islands, and you take in the pristine habitats, the wildlife that allows you to approach within feet, the clean air and beaches, and you see the vast areas you aren’t permitted to touch, you start to become aware….you and the rest of the Homo sapiens coming and going have no musical instrument and just aren’t part of the incredible rock concert that’s going on all around. You’re visitors and you need to get in, have some life-altering experiences, snap some pictures, and then you need to leave and let things get back to normal. I became more than happy to do just that. 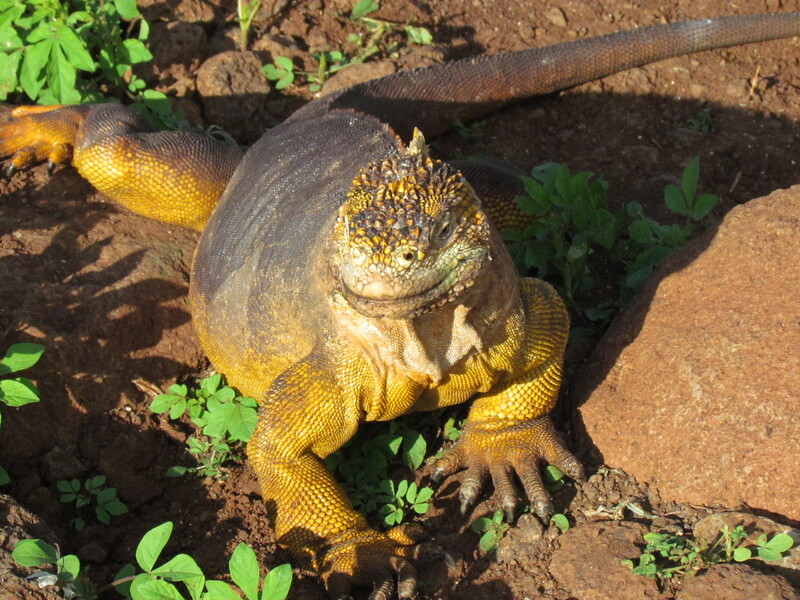 The “control” of visitors has everything to do with maintaining the living laboratory of evolution the Galapagos represent, and with maintaining the unique interactions with Galapagos wildlife. Visit a nesting colony of Nazca and blue-footed boobies, and you get to look into the eyes of one of the beautifully ugly chicks….and see them look back. 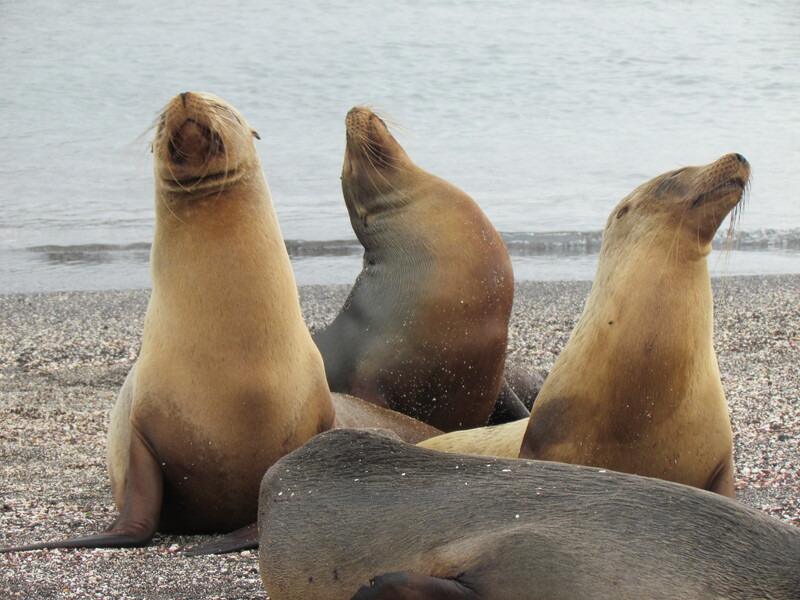 Stand so close to a Galapagos sea lion that you can smell them. 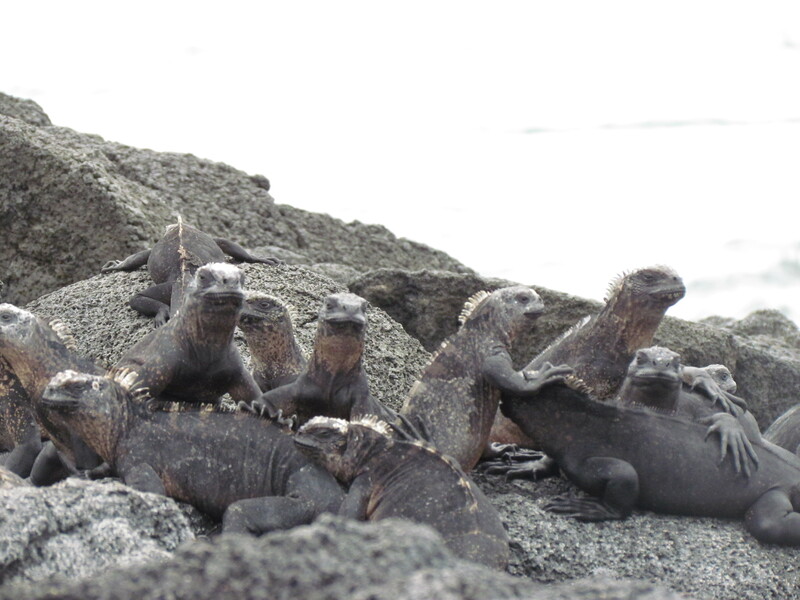 Wait patiently while walking paths for an army of spitting and quarreling, or sometimes frozen statuesque, marine iguanas to move out of the way to let you pass…ON the path of course. Just as moving as these close encounters though, is being able to see entire islands with no sign of development or human activity. It’s a cliché for sure, but it truly feels like the land that time forgot. No lights on shorelines, no docks that betray some rich dudes’ hideaway, no clusters of vacationing gringo yachts tucked into every cove. In fact, if it wasn’t for your guides, you would have trouble locating dinghy landing spots and trail markers in many cases. You can bet that if there wasn’t this level of control for visitors, the Galapagos would be like almost all other island groups in the world. 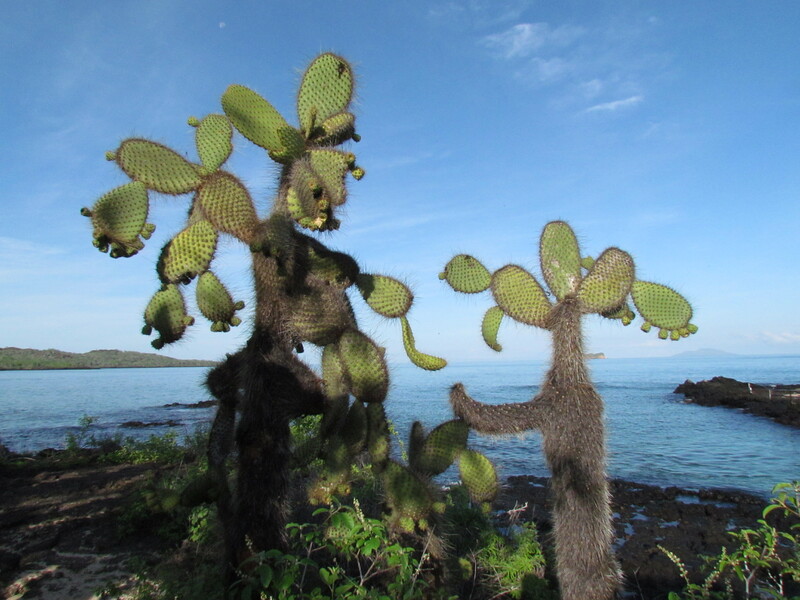 Ecuador seems to truly understand the jewel it has in the Galapagos, and it’s doing a good job as the steward. As you can imagine, there are constant pressures to incrementally open up additional areas of the Galapagos for humans. The number of boats permitted to run cruises is strictly limited, but there’s always pressure to add more. There are no major chain-hotels anywhere in the Galapagos….you can only imagine the money being tossed around in an attempt to tumble that wall. While I was there, there was buzz around the island village of Puerto Ayora about a huge French company that had pitched unbelievable sums of money around to try to be permitted to build a hotel on the amazing Tortuga Beach. They were refused. 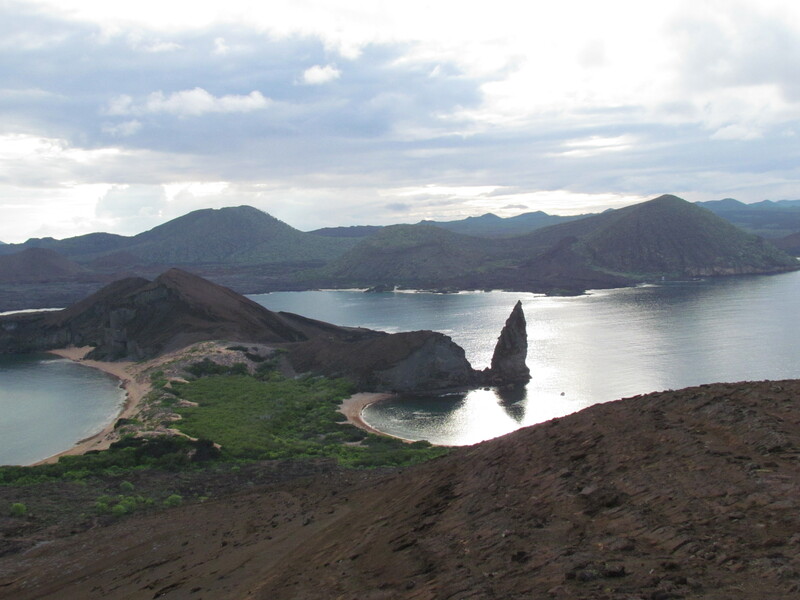 There are three islands with villages in the Galapagos. The villages are sleepy places that are loaded with souvenir stores, restaurants, and ice cream digs on the main strips….but no one is in your face. Tourism definitely is huge to these communities and it’s the major employer, for sure. These villages are sharply demarcated, and there is no question where the villages end and the park starts. Of course, it wouldn’t be the Puma Diaries if I didn’t make it clear that not all is paradise in paradise. Heavy tourism always comes at a cost – there are no exceptions to this reality. There is definite pressure from the communities to allow more development that provides more amenities and services for residents, who are there primarily because of the abundant jobs associated with tourism. 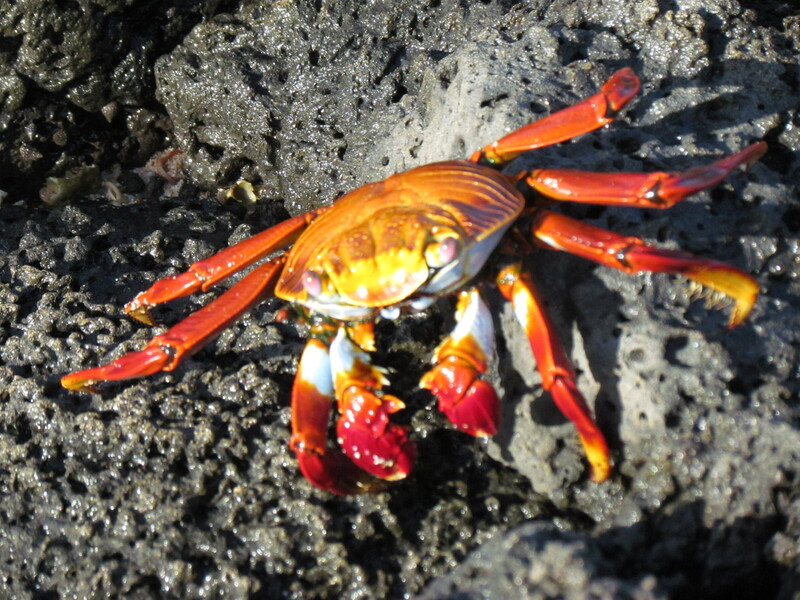 More residents put more strain on the challenges of living in the Galapagos – everything comes from the mainland. 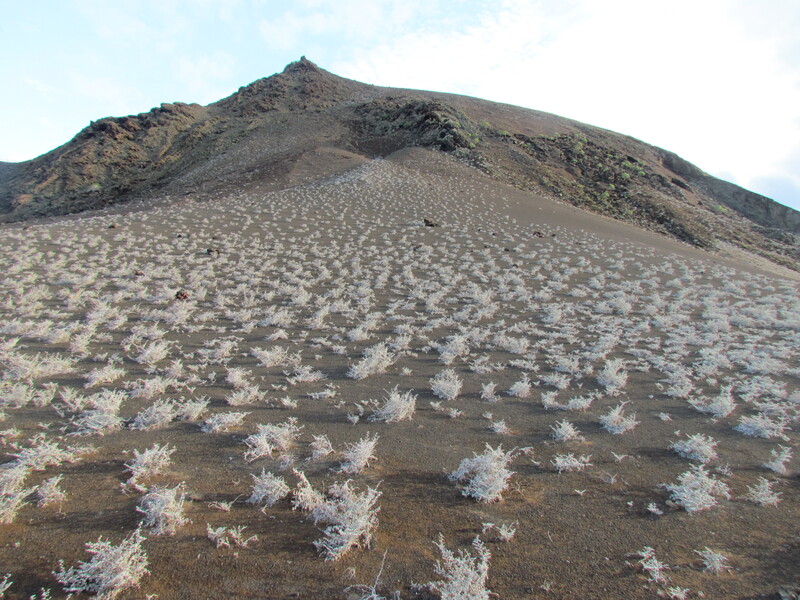 Agriculture is tricky on the volcanic soils and in a climate where the dry season is long and unwielding. There’re murmers among the guides that even the current level of visitation is starting to cause some of the wildlife species to be a bit more shy of human presence. Also, because so many people walk the same paths, some trails are showing signs of overuse. 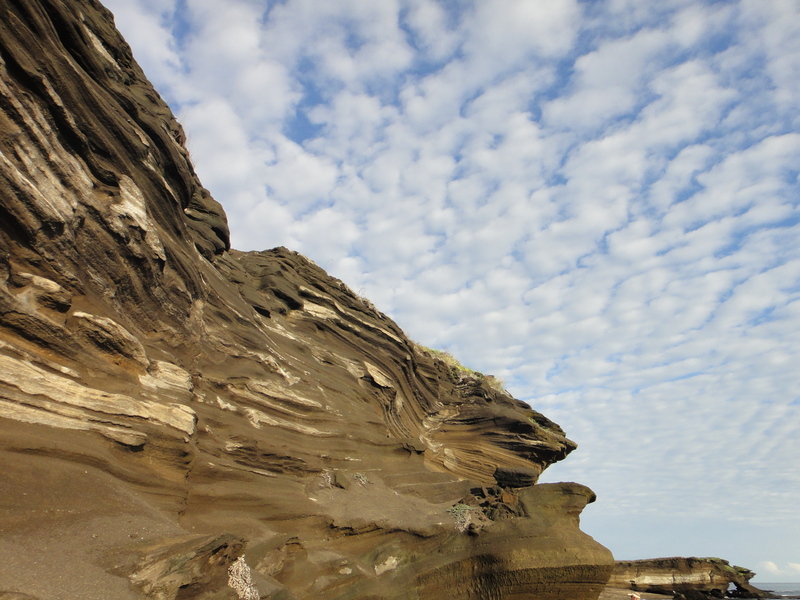 Some of the trails could benefit from attention…erosion isn’t exactly rampant, but it’s definitely visible. Luckily, most of the trails traverse volcanic rocks, beach sand, or coral, all of which take a great deal of traffic without wear. 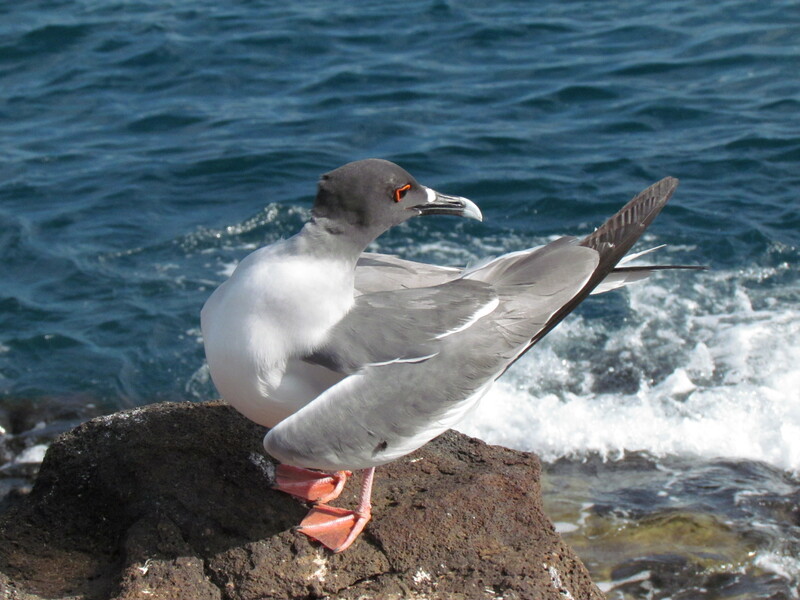 A very significant pressure is that from the earliest days humans showed up on these islands, the Galapagos have been affected by invasive animals and plants brought intentionally or accidentally by humans, and this has sharply altered the natural ecology. Goats, for example, have changed the plant cover of entire islands, and tens of thousands of goats have been eradicated over the years. There’s little chance you’ll be packing a goat in your luggage, but plant seeds travel in the cracks in your hiking shoes and on pant legs, and insects can find all kinds of places to stowaway. Whether you arrive directly from connecting flights from your home base, or have been trekking around in the Andes or the Amazon jungle, it’s not a bad thing to wash your stuff thoroughly before you go and do your part! 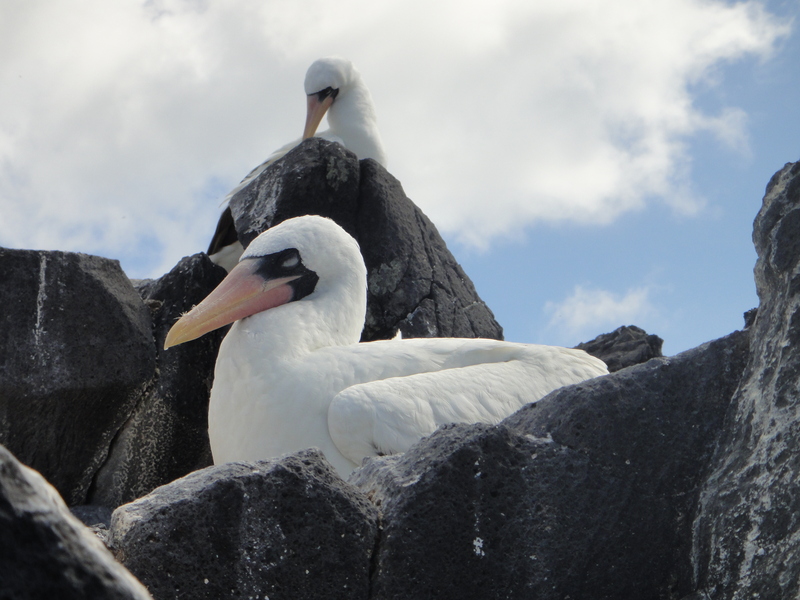 Like natural habitats everywhere else on earth, the Galapagos Islands have their challenges, but at least for now, the “Galapagos experience” is largely intact for visitors. It’s no exaggeration for me to say that they’re simply not to be missed if you can pull off a trip to this destination. And now you can get in the required mindset before your trip, to boldly go…positively and absolutely…only where everyone else who goes to the Galapagos Islands goes…right smack down the middle of the beaten path. Wow, you’ve got some great shots! Awesome post!! You just saved me hours of research trying to find my way around the tours and beaten path-y things to do. Thank you! Can’t wait for us to go there in 2014. Thanks you! You’re very welcome Nicole. I think you’ll find it’ll end up being one of your favorite vacations ever!